Photo taken 6 March 2009. Not having delved too deep into the Canty family history, information on the clan prior to 1880 is thin. Seven years before her passing, Hanora was living in the small village of Millville, Woodford Co., Kentucky just 7 miles southeast of Frankfort. Owen, her husband, had already passed and she was living with her sons John (45), Patrick (46), and Owen (41). Also occupying the homestead was John's wife Hanna (40), their son Owen (8 months), Hanna's father James Brislan (70), and an unknown relation named Ellen Tarpy (68). The entire household, with the exception of the newly-arrived Owen, had been born in Ireland. Hi my name is Shawn Canty great great great great granddaughter of Hanora. 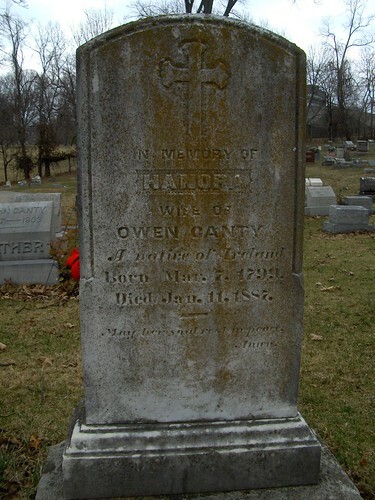 My family is from Cork Co. Ireland, Patrick and John Canty came to the U.S. during the Civil War and then sent for Hanora, Owen and their sister Margaret. I think it's really cool that I bumped in to this post, let me know if you found any more information about the Cantys. Thanks!